Sign Up Today To Get Our Info Packed Newsletter! Select your interests. Pick as many as you like! Think you don’t have the time for a workout? Coach Lew walks you through a quick yet efficient workout you can do outside the gym. All too often we come up with the excuses why we don’t exercise! -I travel a lot, etc, etc, etc! The truth is yes there is an answer to keeping you active and healthy even when the conditions are not optimal! This is why Coach Lew developed the 5 Minute Band Workout and many more quick do anywhere work outs you can do coming soon! Of course we are not saying a 5 minute workout is the end all to be all but it certainly can help re-energize you and get the body moving even when you can’t get a full workout in! All you need for this workout is a set of Sprii workout bands and a Swiss exercise ball which you can order on Amazon by clicking here! SO we have covered the time issue as you can do a workout in just a few quick minutes. We have solved the no gym membership or equipment challenge as you can deflate the ball and pack the bands in to a suitcase or backpack! What about not knowing what to do? 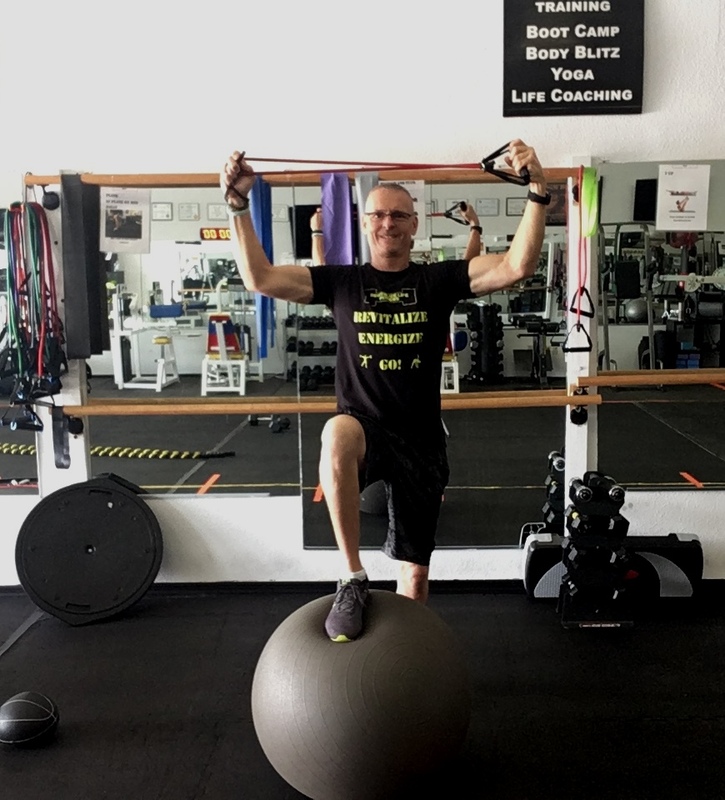 This is where you can check back on our blog as we add more quick workout videos or you can join us at our full service fitness studio for classes or personal training! OK, You say that is great but what if I live elsewhere or travel all the time? Good question! The answer would be to do remote training with us which is a combination of live coaching time with your trainer via Skype or Facetime combined with digital workouts delivered right to your email, cell phone or tablet device! Click here to learn more about remote training and coaching! Always remember to live with energy, passion and always live your dream! *These statements are not intended to be medical advice, treat or cure any disease and have not been evaluated by the FDA and you should always consult your medical professional prior to making any dietary changes or beginning any fitness or self help program. Order Your Work Out To Go Today! Coach Lew's best value and quality recommendations!